Derbyshire Falcons pulled together an impressive array of skills that made the Natwest Blast champions sweat at Old Trafford today. Using sharp fielding and some impressive bowling, the visitors limited Lancashire to 131 then brought out their powerful top order in fine form to chase it down. The forecast gave rain and rain it did, but not enough to prevent almost a full match taking place. A 19 over a side match started about an hour and half late and, while things made a slow start, it was Derbyshire who dominated both innings. Wes Durston won the toss and, aware of the bad weather, put the hosts in to bat first. 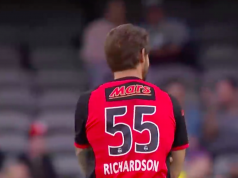 His side then set about the job with some tight bowling and clinical fielding, aided by a slightly slow pitch, that had the Lightning two wickets down for just 39 runs at the end of the powerplay. 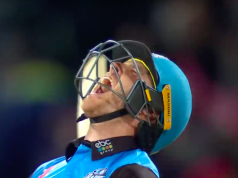 Returning from a long term injury, Tom Smith would have been hoping to get some action today but in the second over it was the visiting fans – all three of them – who were cheering as Smith clipped Jimmy Neesham right to Chesney Hughes in the second over. Shiv Thakor, who had opened the bowling with a cheap first over, followed up by forcing Karl Brown to one out to Durston at mid-off and the hosts were in a spot of bother before six overs were done. Jimmy Faulkner or not, Lancashire do not lack depth, but Derbyshire had a good dig and soon Alviro Petersen, Steven Croft – who had set up a small fight-back and ended the hosts’ boundary drought – Arron Lilley, Liam Livingstone and finally Alex Davies were all back in the shed. Lancashire had made just 131-7. Neesham exuded confidence and experience with the ball, which is why Derbyshire signed him, and it seemed to rub off on some of the less experienced crop of players. Matt Critchley, making his T20 debut today in place of Ben Cotton, did not take a wicket but let just 19 runs through in his four overs. If it was raining water earlier in the afternoon, by the time the Falcons picked up their bats it was raining boundaries. Durston got things going with a boundary first ball and it carried on from there. The Captain reached an explosive 30 off 15 balls, giving his side the best possible start, before George Edwards had him walking off. Perhaps the pitch improved or perhaps the Falcons pair of Kiwis, Hamish Rutherford and Neil Broom, just know how to make it work for them. Durston’s would be the only wicket to fall as the Falcons tore the Lancashire bowling apart and chased down the total in just under 14 overs. Rutherford’s destructive 71 off 40 balls, with 6 fours and 3 sixes, was the centre of the chase but Broom played a strong second with his 25 runs. Speaking after the game, Derbyshire captain Durston said: “It was the perfect start really. We come here and expect a tough game. The fact that they’re defending champions, it was great to come here and get the two points. “We got an early wicket and that relaxed us. The first game everyone’s energy levels are really high and you can sometimes do silly things. But getting that wicket calmed us down and we controlled the powerplay and adjusted the way we bowled to that wicket. “132, the pressure’s on us to win the game. They will feel they were under par. We tried to get off to a fast start and above the rate before the spinners came into the game. Lancashire’s director of cricket was somewhat less happy, saying: “We’ve been pumped really by Derbyshire. Credit must go to them, they played really well.